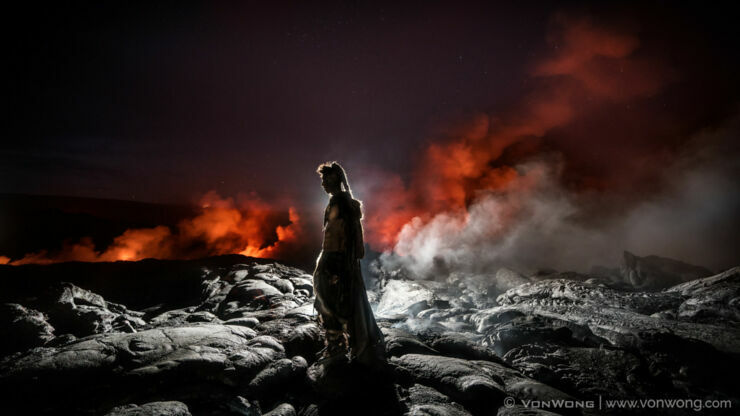 Real life photoshoot in lava filled mordor! When it comes to locations to conduct a photo shoot, some are more problematic than others. None probably though as dangerous as an active volcano surrounded by lava that can reach up to 2000 degrees Fahrenheit while a toxic cloud of sulfur dioxide wafts in the air. 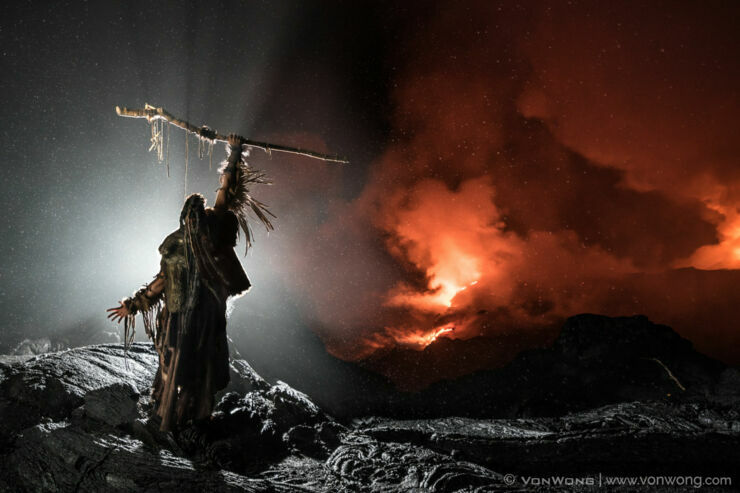 This is where photographer Benjamin Von Wong (previously) decided to shoot some epic, Modor-esque scenes for his Surreal Lava Portraits. 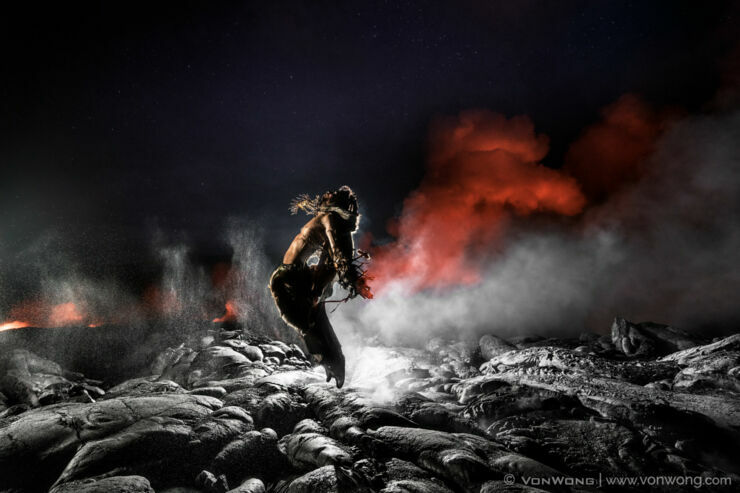 The project was undertaken to raise awareness of climate change, and support the St. Boniface Haiti Foundation charity, and saw Wong and his team trek several miles lugging lighting kit, camera gear, video setup, costumes, props and stands across volcanic rock on Hawaii's Big Island. 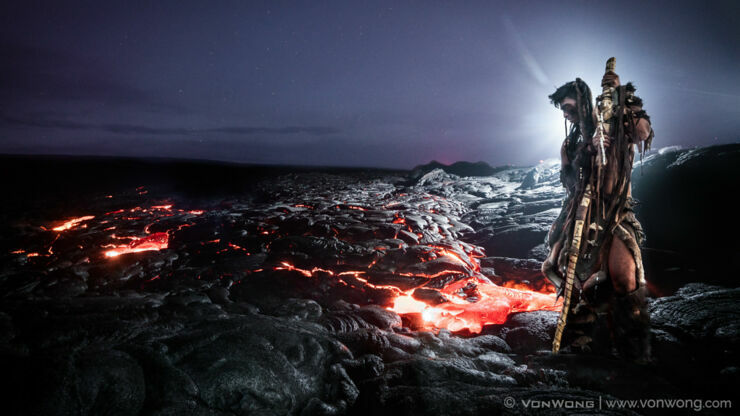 To aide them on this post-midnight hike they recruited lava expert and photographer CJ Kale. He was able to advise them how close they could get to the lava and where to find it. "We navigated by the clouds, hunting for the signature soft red glow of lava in the distance." Wong writes on his website. "It took us three hours and almost four miles to reach the lava flows." Once there though, the team set about lighting the shoot to get the right, post-apocalyptic effect. The models, in costume, stood next to the surface flows, but only for short periods of around 15 seconds. They also needed to spray the models with water so they could get closer. It was the water spray that also proved crucial to the look. 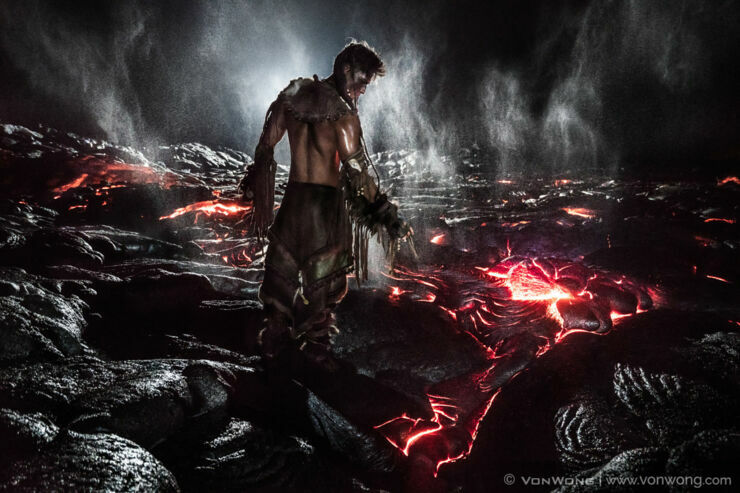 "The 2L water sprayer ended up being the the true MVP of our shoot, not only creating an ethereal glow that resembled steam rising out of the cracks, but also serving as a safety spray to make sure our model stayed cool as he inched closer and closer to the lava." notes Wong. 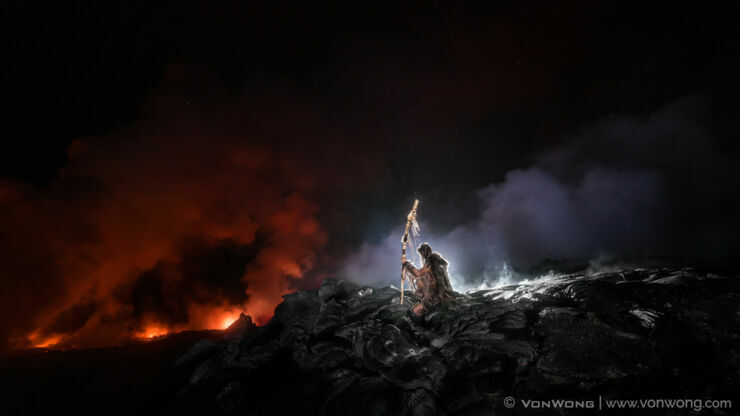 "Shooting on the lava fields, was a reminder to the team how small and fragile we are in the face of nature." You can check out the results below and head to Wong's website for more information on how they did it.